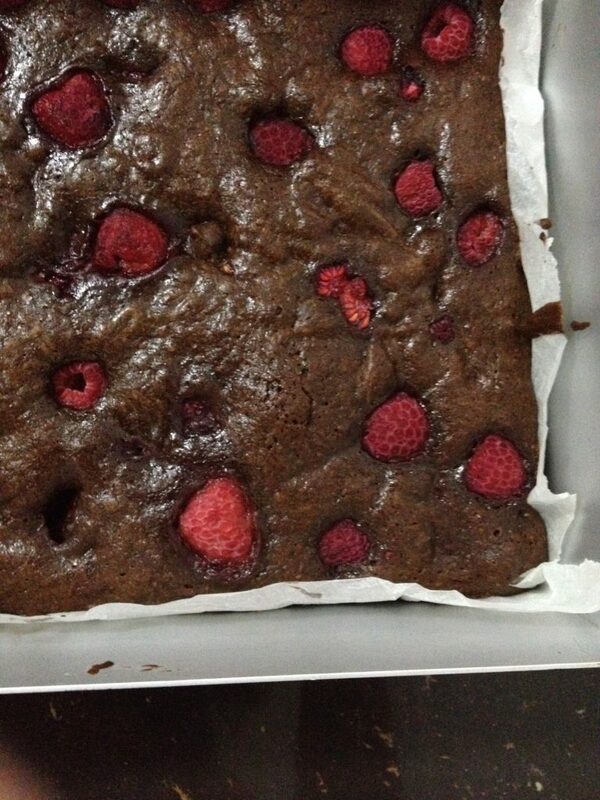 I don’t understand why I’ve never put raspberries in a dark chocolate brownie before. 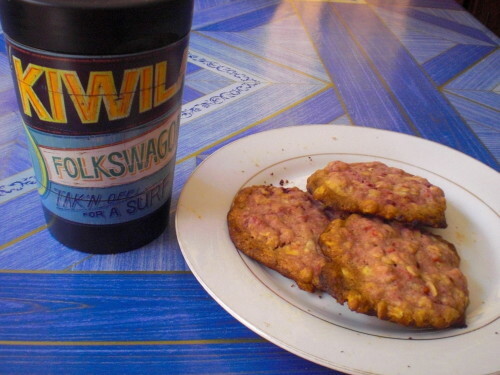 The flavour combination is ingenious! These brownies have quickly become my signature bake since I decided to bake them 7 weeks ago, popping out my oven week in-week out. 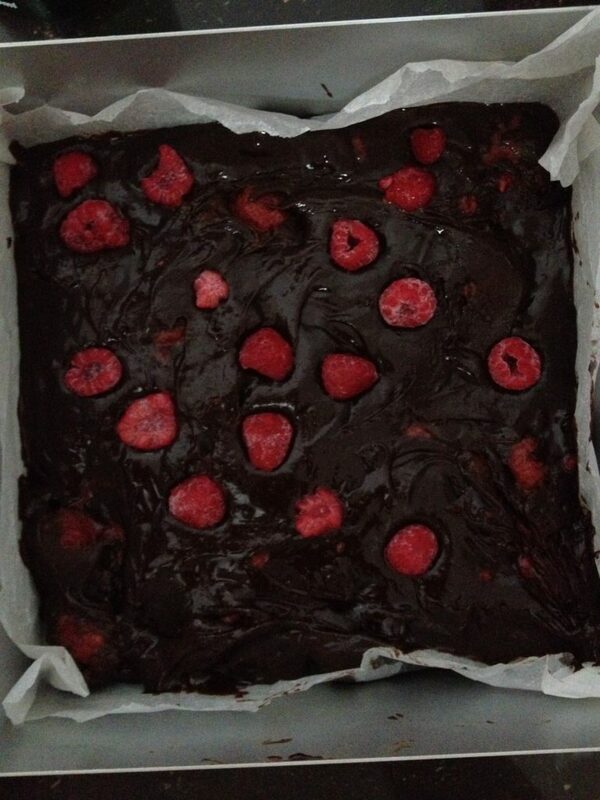 I meant to follow BBC’s Good Food’s Best Ever Chocolate Raspberry Brownies and duly noted that they suggested mixing half of the raspberries into the mixture and reserving half of the raspberries to scatter at for the end. However, I couldn’t quite understand why I’d want to put milk chocolate into the batter and dilute the intense dark chocolatey-ness that I wanted to couple with the raspberry flavour. So, I reverted back to my default brownie recipe. This time, I have no microwave. (However, I’ve kept the microwave bit in the instructions, in case you do). I really wanted to demonstrate how the brownies can be made using one pot. In all honesty, I never expected that this brownie would have it’s own post. 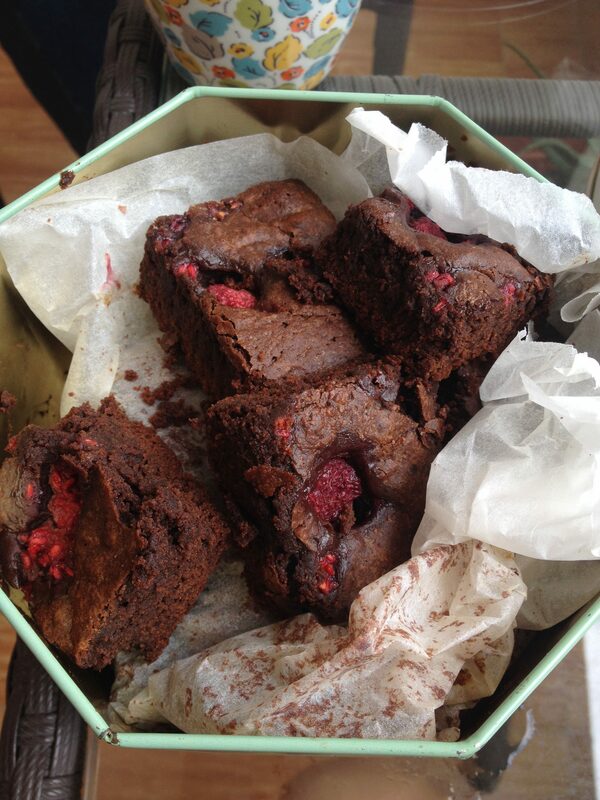 But when Sarah and I bit into one, the first occasion I baked them, a raspberry just burst in my mouth. I laughed, said that they were amazing and promptly named them, Raspberry Burst Brownies. Ingredients for Raspberry Burst Chocolate Brownies adapted from Usborne First Cookbook. 1 or 2 tbsp of milk if the mixture is too firm. 1. Preheat the oven to 180C/350F/Gas Mark 4. Line a square baking dish with baking paper. I use a 20x20cm baking tin. 2. 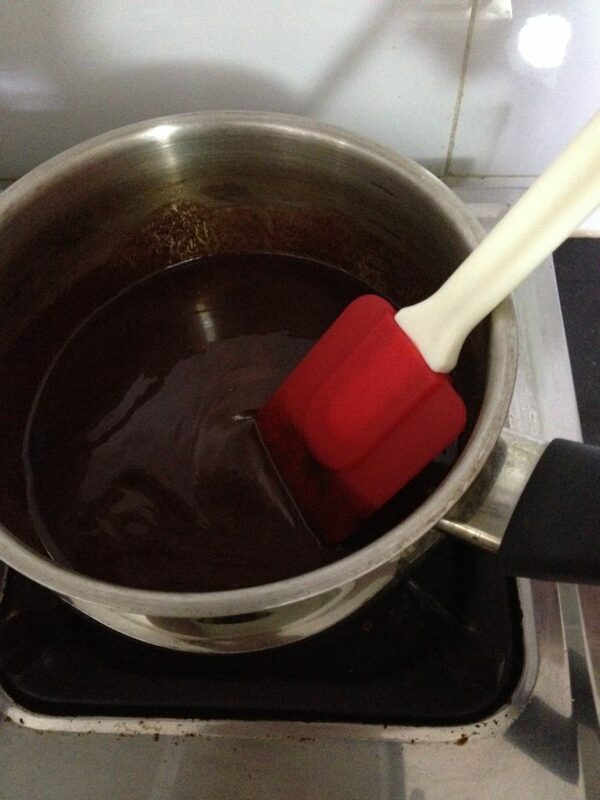 Melt the chocolate and butter together on a gentle heat, in a heavy bottomed pan. Alternatively zap them in a heatproof bowl in the microwave. 3. As the chocolate and butter is melting, or being zapped in the microwave, measure out the flour, baking powder and cocoa powder into another bowl. Sift the flour if you want to, but it’s not necessary. 4. 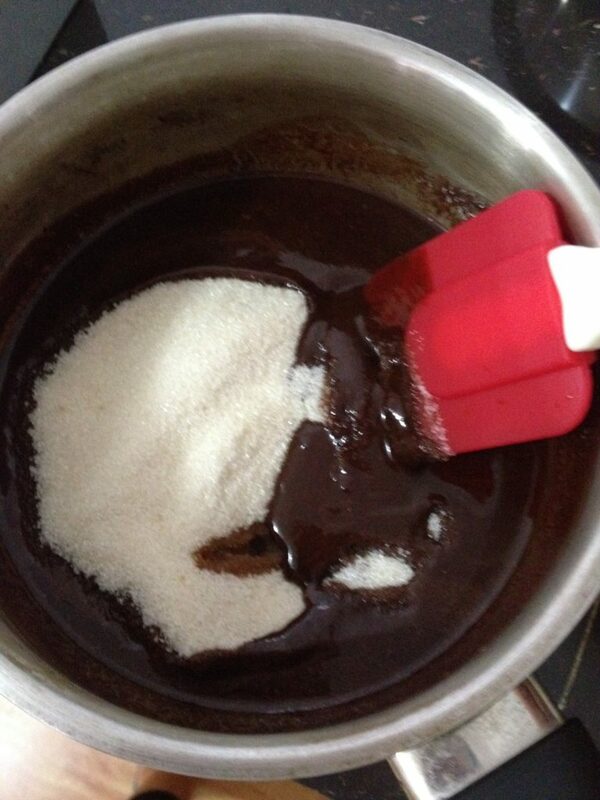 Add the vanilla extract, salt and sugar to the chocolate melted goodness and mix well. 5. Add the beaten eggs and keep mixing to combine it all. Don’t worry – they won’t scramble. 6. 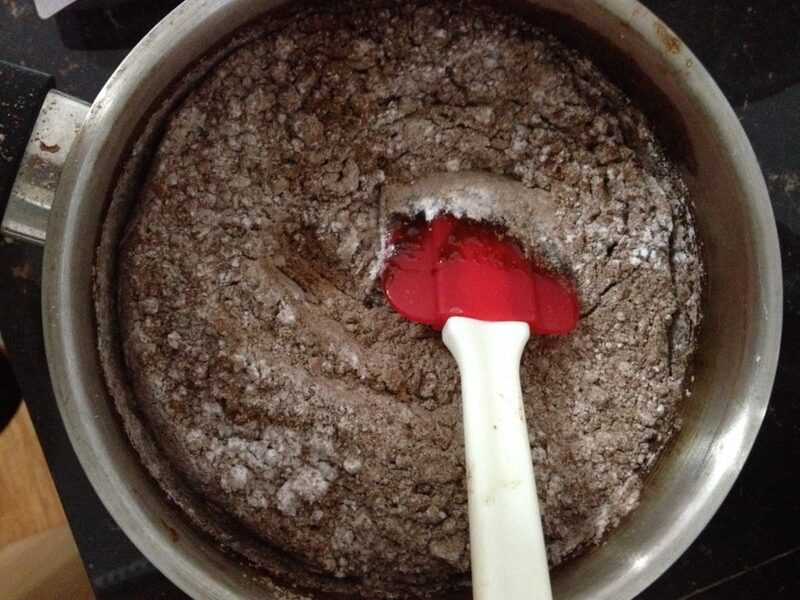 Gradually add in the flour, baking powder and cocoa powder so that the whole mixture is well combined. 7. Mix in half of the raspberries now. With the remaining half, scatter them over the top to fill in any deficit spaces before you put it into the oven. 8. Bake in the oven for 20-25 mins. The secret is to take them out when the top is firm to touch but still wobbles when you shake it. Verdict? They are amazing! Sarah actually told me off for not telling her how amazing they were, when she ate one a few weeks later. (But we’d taste tested them together that first time…) They are that combination of sweet but sour, and a perfect flavour partnership between the dark chocolate and the raspberry. But what I love best about them is that the whole raspberries burst in your mouth as you eat them. Bliss! 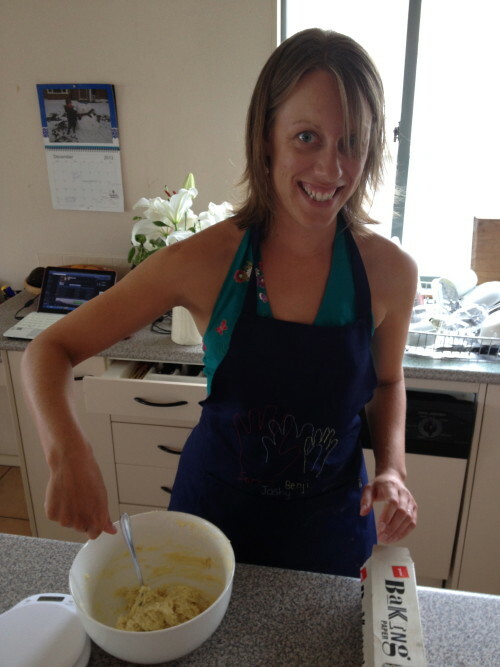 Over Christmas and New Year, I visited my friend Claire in New Zealand. It was my first trip to a first-world country, since I’d moved to Cambodia. And boy, could you tell! If you know the story of country mouse (moi) visiting town mouse (Claire). Well, that says it all really… The first night that I got there and I was snuggling into my bed under my duvet after a hot shower, I was beaming. 1. Larking about with Jen and Claire. 2. Drinking in the greenery, mountains and sheep!!! Reminding me of Scotland. 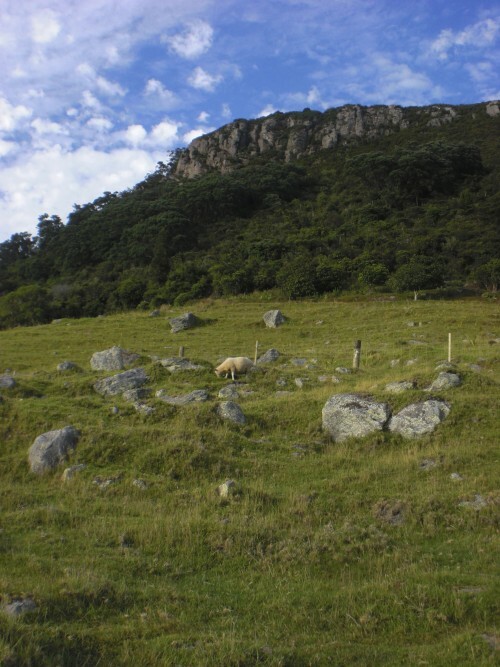 Mount Maunganui – 10 minute cycle from Claire’s house. One evening we were having quite a frank discussion together with her housemates about what can hold us back from doing things or giving it a go. I’m not referring to procrastinating doing the ironing or filing away the bank statements. You know what I mean: shying away from ‘that’ conversation, not putting your hand up to ask the conference speaker a question, refusing to speak a foreign language. So, what is it for you? Is it the fear of losing, the dislike of being in the limelight, the discomfort of your brain cells having to work so hard, the embarrassment of looking like a fool? We all owned up to at least one of those things. Then Claire very matter-of-factly put out there, that one of the things that helps her to just give things a go, is that she gets a kick from doing something but not doing it well. She gave her own example that she’ll never be a pro-surfer but nevertheless, she keeps surfing and enjoys it a lot. Is she slightly kooky for owning such an attitude? Or is that one of the secrets of relishing life and taking hold of opportunities when they present themselves? I leave that to you to mull over. And Jo Seagar. 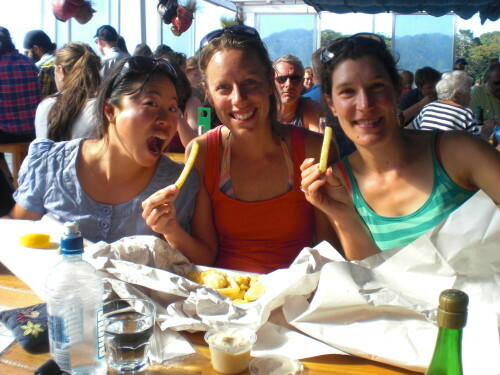 I’d never heard about Jo before but she’s a big star in the Kiwi culinary world. Claire and her housemates love her recipes, and I’ve taken note of her name now. 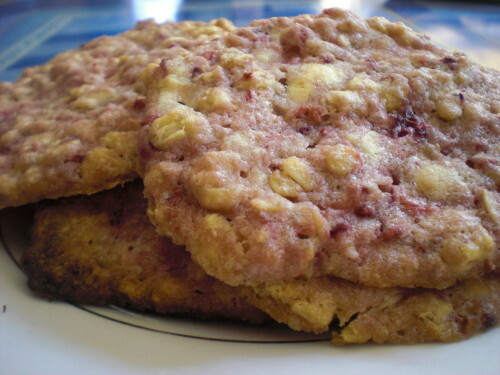 Claire adapted this cookie recipe from one of Jo’s recipes and now it’s known as ‘Claire’s cookies’ by her friends. Perhaps because she makes them a lot, and they are incredibly deliciously and more-ish. I know because she made them when we got back from our camping trip in Russell. Her housemates and I pretty much gobbled up the whole batch in one sitting. (I hasten to add that she did halve the recipe.) Even so, she was amazed that they went so quickly. Seriously? They go down so well with a cup of tea. Claire’s genius was replacing the glacé cherries in the original recipe with raspberries. White chocolate can be sickly-sweet sometimes. The sharp, sweetness of the raspberry cuts through this and complements the white chocolate beautifully. The oats provide texture and bite. 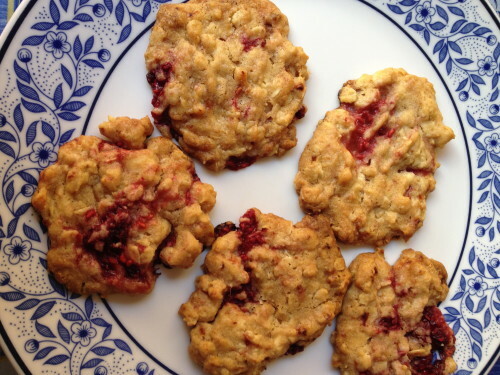 When I made these cookies back home, I made the mistake of stirring in the raspberries too vigorously, breaking up the raspberries so that the mixture turned pink. Pretty, but not tasty. The flavour of the raspberries dissipated and they weren’t nearly as nice as I’d remembered them to be. The two photos below illustrate the difference. 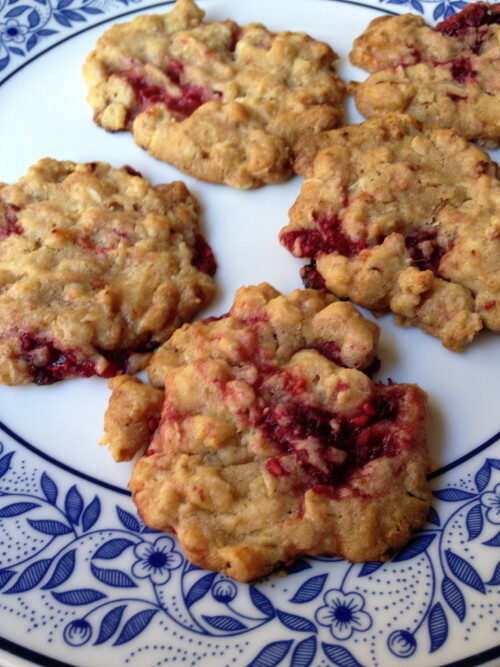 The photo on the left was my first batch of cookies and I broke up the raspberries too much. The second batch (photo on the right) was much better. Take note, gently mixing in the raspberries is the secret to the having bursts of raspberry in your mouth. 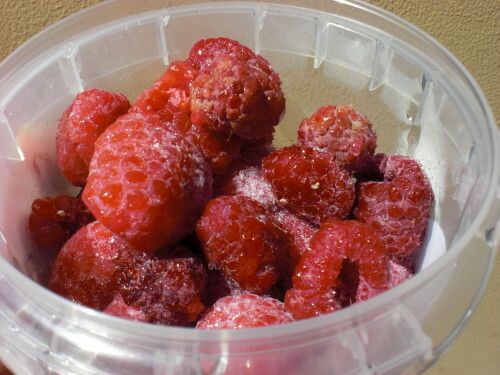 I also found out that in Phnom Penh a) frozen raspberries are difficult to source and b) cost $22 per kilo from Thai Huot! So, when you make these in a temperate climate where raspberries grow naturally, remember $22 and just how lucky you are. 175g sugar – Claire uses ordinary white granulated sugar and they turn out amazing. I used a combination of white and light brown sugar and they were also good. Moral of the story – use whatever sugar combination that tickles your tastebuds. 1. Preheat the oven to 170°c/325°F/Gas Mark 3. Line baking trays. 2. 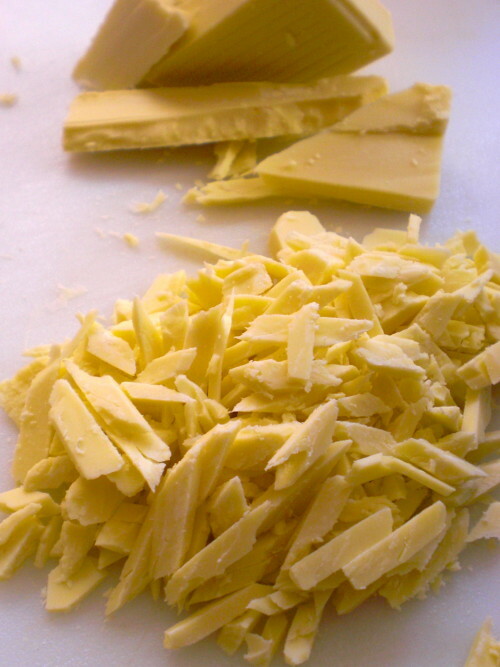 Beat the butter, sugar and condensed milk together until the mixture is pale and smooth. 3. Stir in the vanilla, rolled oats, flour and baking powder until the dry mixture has just combined with the wet mixture above. 4. Gently mix in the white chocolate and the raspberries. Be careful not to break up the raspberries too much. 5. 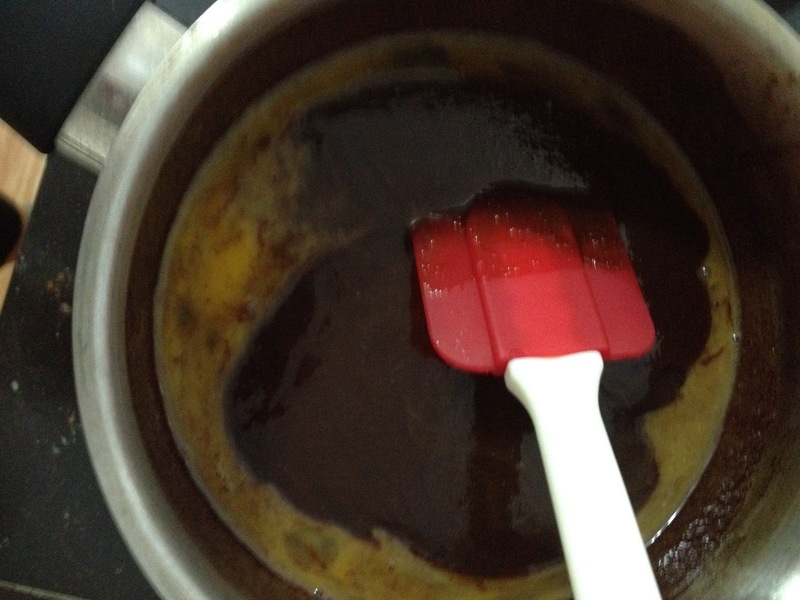 Place a tablespoonful of mixture on the baking trays and press flat with a wet fork. They will spread out slightly so leave a couple of fingers width between each tablespoonful of mixture. 6. Bake in the oven for 20-25 mins until golden brown. Allow to cool for 2-3 mins on the trays and then transfer to a wire rack to cool completely. Apparently they will keep in an airtight container for 10 days to 2 weeks. They lasted less than 5 days in mine. Cranachan – pronounced ‘cran-ah-hkun’ (the ‘ch’ being the soft, guttural, scottish ‘ch’ sound, as in loch’). 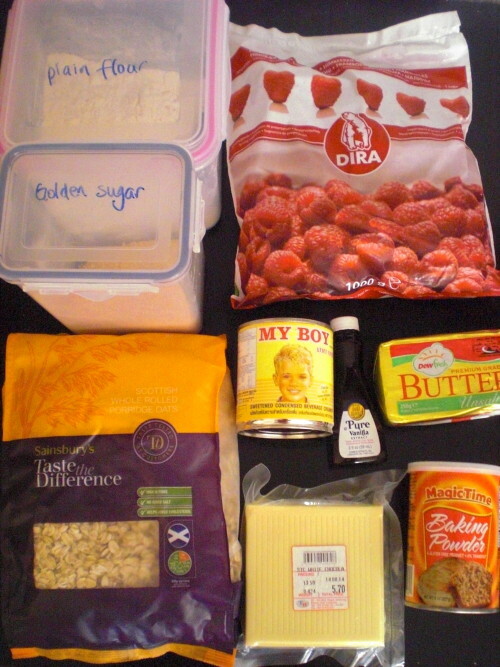 The scrummy, scottish dessert made with raspberries, whiskey, honey blended with cream and sprinkled with oats. I’d like to appease the purists in cyberspace by letting them know that I had planned to serve it up in the traditional way at my Haggis, Neeps and Tatties in 3 ways Dinner Party. Well, there was more improvising in store. I know that you can make the roulade base purely with egg whites and sugar; there were too many online recipes demanding that I add in some sort of flour or flour substitute. So, that’s when I came up with the idea of using toasted oatmeal. And as I couldn’t find a recipe for an oatmeal meringue online, I made it up. So, as the hand beater is whisking the egg whites, balancing somewhat precariously on the bowl, I measure out the oats, scatter them across a baking tray and carefully toast them in the oven until a wonderful nutty smell wafts around the kitchen. As you can imagine, I had more moments of K-mix envy as I stood attached to my electric mixer, passing it from one hand to the other as I waited for stiff peaks to form. I can only imagine the freedom of leaving the egg whites to whisk in the stand mixer, while I line the tin, toast and ground the oatflakes… Admittedly, not that it stopped me but that procedure wouldn’t have held the same amount of trepidation. Naturally, I wanted to omit the cream to create a healthier, lighter dessert and I replaced it with full-fat greek yoghurt. If you’d like to do this, then wait until it’s almost time to serve the dessert before you start spreading the greek yoghurt onto the base. It’s much runnier and wetter than whipped cream so will seep through the base, softening the structure. My guests really enjoyed the cranachan roulade on Saturday night. The raspberry, honey and whiskey combination is sweet but not overpowering. Those who like oats particularly enjoyed the nutty, oaty flavour of the base. So I’d make this again with a few tweaks (see below). 3 tsp runny honey, preferably of the heather honey variety. I didn’t have any so I used a Thai honey instead and it was good. 1. Preheat the oven to 180°C/350°F/Gas Mark 4. Line a 23x33cm swiss roll tin (or a similar sized baking tray with raised sides) with tin foil or baking paper, folding the sides up so that you create a raised 4cm border and squeeze the corners together. Lightly spray or brush with vegetable oil. 2. If you are using a stand mixer, then you can do step 2 after you begin the whisking of the egg whites described in step 3. Measure out the oat flakes and spread them on a baking tray and pop it in the oven for 4-5 minutes. Then take them out, turn them over and pop back into the oven for a few more minutes. The oats should be a very light brown colour and smell deliciously nutty. Leave to cool for a few minutes and then grind them up in a food processer until they are the texture of ground almonds, at the very least. I think that I created oat flour, I ground the flakes so fine. 3. Whisk the egg whites until they have a firm peak. 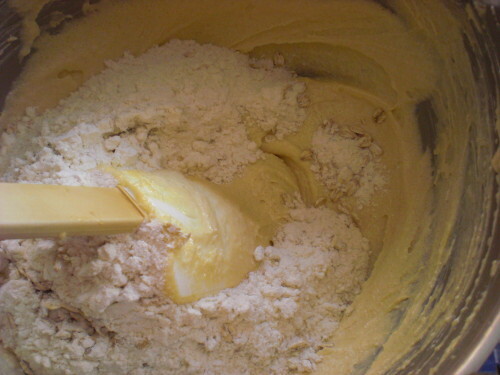 Then add the caster sugar in 4 stages if you are using an electric beater, or all in one go if you’re using a stand mixer, continuing to whisk for 5 minutes until stiff peaks form. I used an electric beater and made the mistake of adding all the sugar in one go. The resulting base was fine but it took at least 15 minutes before anything vaguely resembling stiff peaks formed. 4. Now add the ground oatmeal to the meringue mixture. Fold it in using a metal spoon until it is just mixed in, making the utmost effort not to knock out the volume in the meringue mixture. 5. Spoon out the meringue mixture onto the prepared tin and evenly smooth it out using a palette knife. Now pop it into the oven and bake for 15-20 minutes, until it is firm to touch and ever so slightly brown on top. In the meantime, prepare an additional sheet of foil or baking paper that is just larger than the size of the tin and sprinkle it with icing sugar or caster sugar. I didn’t do this and in hindsight I think that it’s a good way to further ensure that the base doesn’t stick to the foil. 6. Take the roulade base out of the oven and allow to cool for about 3 minutes. Here comes the slightly scary part, akin to when you flip pancakes, so do it with confidence. Quickly invert the baking tin onto the prepared sheet of foil, so that the lining is on top. Leave for a few minutes, then gently remove the foil on the base. Don’t worry if a few bits come off. No one will see it anyway. Leave to cool completely. *You could make it up this point the day before and leave the base out on the side, like I did. 6. For the filling, empty the yoghurt into a medium sized mixing bowl. Mix in the whiskey and honey. Spread the mixture evenly on top of the base but leave 2cms round the edges cream free. Sprinkle a thin layer of raspberries on top, reserving a few raspberries to decorate the roulade. 7. Now to roll. This proved trickier than I anticipated. Not helped by the fact that I chose to roll with the longer edge and my hands are too small to do it. When you’ve finished rolling, leave the foil around the roulade so that it is easier to gently transfer the roulade onto the serving dish. Or, if you are using cream, then you can store the roulade in the fridge for a couple of hours with the foil tightly wrapped around it before serving. 1. Sprinkle the foil with icing sugar or caster sugar before inverting the base onto it. This helps prevent the roulade base from sticking to the foil. 2. Make a cut along the edge of the roll, about 2 cms in, that you’re going to begin rolling with so that you are only cutting halfway into the base. This will help you create a roll, as opposed to a circle. Just so that you know, unlike moi, most people use the shortest edge. 3. Use the foil to create tight roll by firmly pulling the foil horizontally away from you with one hand and at the same time gently pressing down on the foil with the other. Do it slowly to start off. 4. Here’s an online video tutorial. Variations on the theme: I’d like to experiment with a few tweaks to this recipe. Next time, either make a raspberry sauce by crushing raspberries and adding sugar to it or make a raspberry compote. Spread the raspberry sauce on the base. Substitute mascapone in place of the greek yoghurt or cream so that there’s a firmer mixture before adding the raspberries, rolling it up, sprinkling with icing sugar et voila! If you don’t have buttermilk, you can substitute it with natural yoghurt but it doesn’t quite taste the same. Better yet, I have since learned how to make my own buttermilk, the cheat’s way. The proper way requires either churning butter and using the leftover milk (hence the name, buttermilk) or shaking a pot of double cream for a l.o.n.g time for the same effect. The raspberries all sank to the bottom the first time I made this (the cake still tasted scrumptious). I had a hypothesis that the fruit wouldn’t sink if I first lightly powdered them with flour before I added them to the cake batter. So, I tested this out the second time I made this cake. I poured the batter into two cake tins and scattered in one, lightly floured raspberries, and the other with bright, red raspberries. When both cakes turned out beautifully with raspberries floating dreamily on top, I was flummoxed as to why the first time round had been a disaster. However, now I’m remembering that I forgot to preheat the oven and so the batter was left out for a while, so maybe the raspberries sunk then… *sigh* Basic common sense, Miss Cha – remember to switch on the oven and turn on the cooker at the mains so that the oven can actually preheat. 1. Preheat the oven to 200°C/400°F or Gas Mark 5 and line a 18-20cm cake tin, or alternatively dust it lightly with flour. 2. Cream the butter and sugar together for about 2-3 minutes with an electric mixer (I finally got one!) or 5-7 minutes by hand. 3. Mix in the vanilla extract, the lemon zest, and then finally the egg. 4. In a separate bowl, measure out the flour, baking powder, bicarbonate of soda and salt. 5. Slowly add 4. and the buttermilk to the wet mixture. I’d recommend adding the flour in three batches, alternating each time with the buttermilk. This way, it will be easier to mix and the mixture won’t curdle. If you’re doing this with an electric mixer, do it at a low speed. 6. 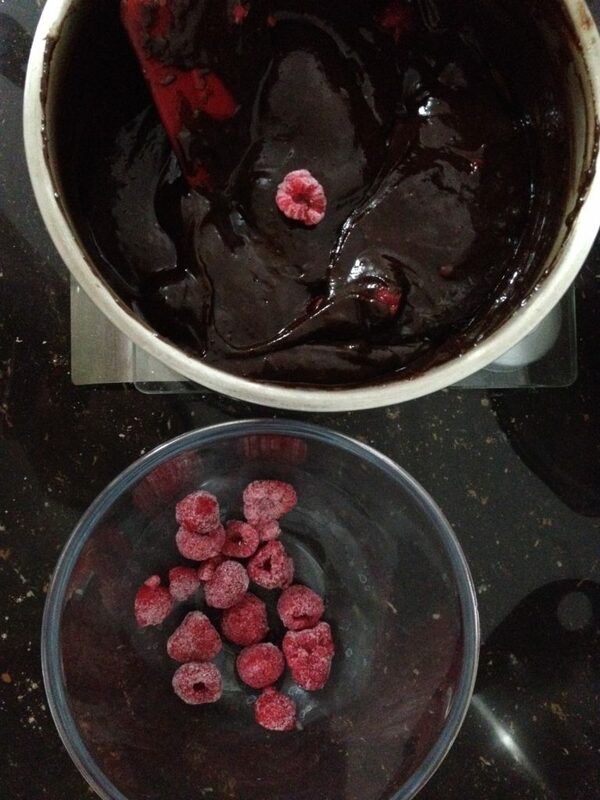 Spoon the mixture into the tin, smooth the top, then scatter the raspberries evenly on top of the mixture. Sprinkle 1 tbsp of caster sugar over the raspberries. 7. Pop it into the centre of the oven and let it bake for about 20-25 minutes, or until the tester/knife comes out clean. 8. Let it rest in the tin for about 10 minutes, and then cool on a wire rack. The verdict? Well, this cake is a winner in my eyes. Its simple to bake and you can make this cake and eat it within an hour. It is wonderfully moist from the buttermilk and the raspberries lend a lovely freshness to it. Also, the cake tastes delicious, even when the berries have sunk to the bottom. If that happens to you (and I don’t think it should as long as you remember to preheat the oven) here’s how I remedied it – by serving the cake, turned upside down. You could also sprinkle lots of icing sugar on it. p.s. The cake freezes well too. Wrap it up twice with foil and a plastic bag to freeze it. Just take it out the freezer the night before and leave it on the side to defrost it – simple.